Lasers are becoming more and more popular and especially mobile DJs and smaller nightclubs often request a product that is easy to operate, capable of projecting tunnel effects, layers and some basic shapes and figures, and most importantly can write custom messages as running text. And of course the laser should be RGB and white light for being able to make the projection fit in with the lighting design. 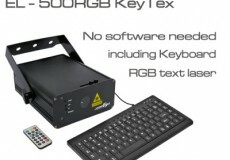 This is quite demanding, but the new Laserworld EL-500RGB KeyTEX offers all these features: Besides being a normal laser system that can be run stand-alone, in sound-to-light mode or controlled by DMX, it also comes with a remote control plus a keyboard for entering text, animating it and doing color changes. The Laserworld EL-500RGB KeyTEX is the successor of the Laserworld ES-400RGB, as it has all the features seen previously in the ES-400RGB – but adds much more on top. This is not just a “text-laser”, but a feature rich, all round laser system designed for the entertainment business, with no additional software necessary for operation. The projections made with the Laserworld EL-500RGB KeyTEX can either be projected as single output (normal scanner mode), but it is also possible to slide a diffraction grating into the beam path to multiply the projection and cover a much wider angle filling the room with an RGB cluster effect, covering the walls with RGB text or patterns. It is obvious that a product for mobile DJs and small nightclubs must be reasonably priced to meet the budget, which the Laserworld EL-500RGB KeyTEX does, even though it is packed with features. 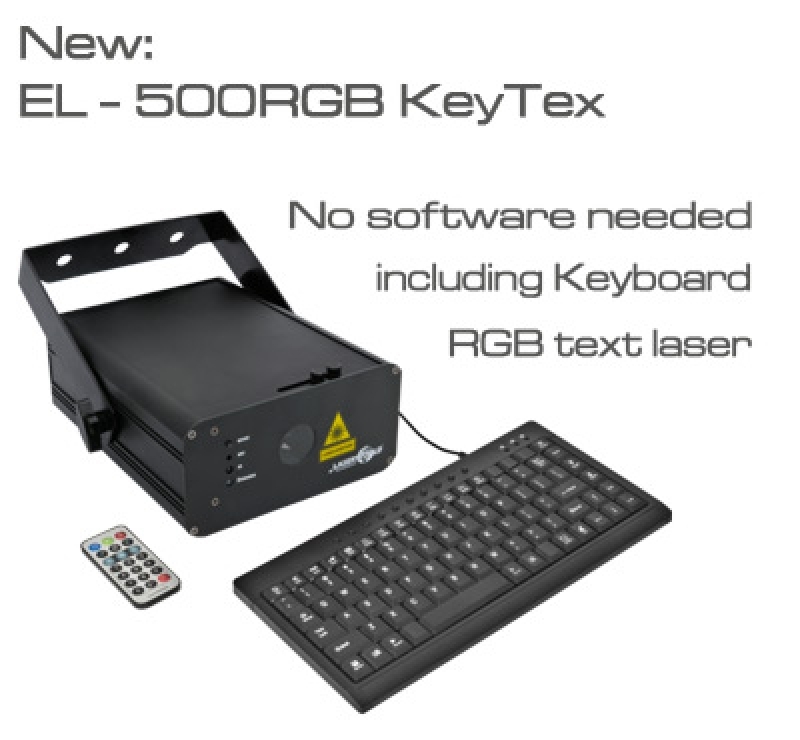 The Laserworld EL-500RGB KeyTEX is now available at retailers and distribution partners of the Laserworld Group. This text laser is equipped with a strong red (650nm, 180mW), green (532nm, 80mW) and blue (445,nm, 160mW) laser source, so the projections are well visible. The scanning systems allows for simple text projections and runs at ca. 15kpps@4°.